Two sensitive, selective, economic, and validated spectrofluorimetric methods were developed for the determination of ebastine (EBS) in pharmaceutical preparations depending on reaction with its tertiary amino group. 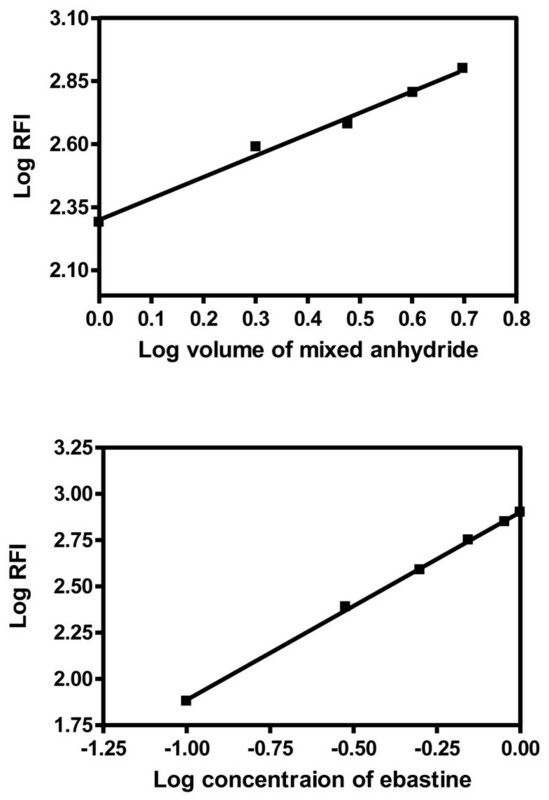 Method I involves condensation of the drug with mixed anhydrides (citric and acetic anhydrides) producing a product with intense fluorescence, which was measured at 496 nm after excitation at 388 nm. Method (IIA) describes quantitative fluorescence quenching of eosin upon addition of the studied drug where the decrease in the fluorescence intensity was directly proportional to the concentration of ebastine; the fluorescence quenching was measured at 553 nm after excitation at 457 nm. This method was extended to (Method IIB) to apply first and second derivative synchronous spectrofluorimetric method (FDSFS & SDSFS) for the simultaneous analysis of EBS in presence of its alkaline, acidic, and UV degradation products. The proposed methods were successfully applied for the determination of the studied compound in its dosage forms. The results obtained were in good agreement with those obtained by a comparison method. 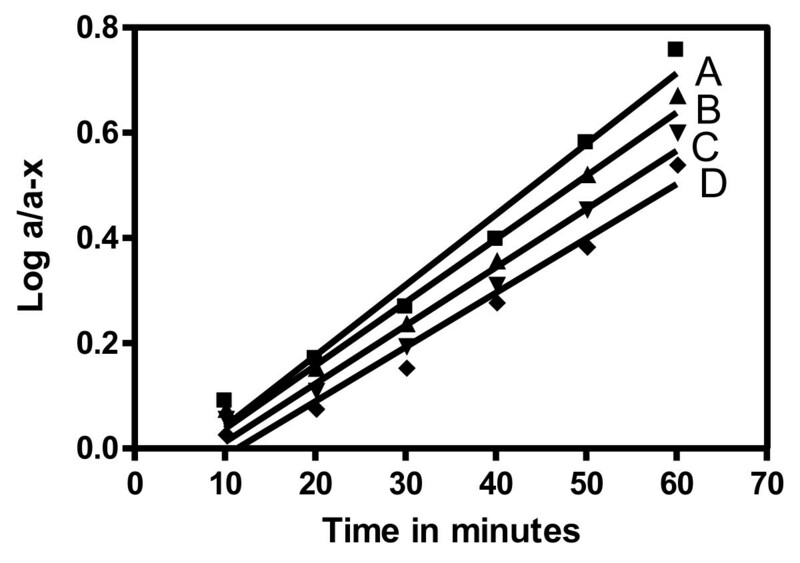 Both methods were utilized to investigate the kinetics of the degradation of the drug. Ebastine;(4'- tert.-butyl - 4-[ 4- (diphenylmethoxy) - piperidino] butyrophenone (Figure 1), is a potent long acting antihistaminic H1 receptor antagonist drugs . Literature survey reveals that only high performance liquid chromatography was used for the estimation of ebastine in presence of its metabolites [2, 3]. Although chromatographic methods offer a high degree of specificity, yet they require large amount of high purity organic solvents and generate high amount of waste. Therefore, there is a need for an alternative substitute to these techniques for the routine quality control analysis of the concerned drug. It is clear that there is a need for a method that is sensitive enough to monitor the drug level after therapeutic doses. Spectrofluorimetry by virtue of its high sensitivity meets this requirement. The proposed methods have some distinct advantages that render them promising substitutes for HPLC methods. A number of organic acid anhydrides are capable of forming colored products with tertiary amines ; malonic, citric, and aconitic acids are representative examples. Aconitic acid however was found to be unsatisfactory as invariably a purple solution resulted on heating to dissolve the acid . Tramadol, acebutolol and dothiepin were determined based on the condensation of the cited drugs with malonic and acetic acids  where the colored products were suitable for spectrophotometric and spectrofluorimetric measurements; while citric/acetic anhydrides were used for the spectrophotometric determination of nizatidine , and some H1 receptor antagonists  namely; cetirizine, fexofenadine, loratadine and acrivastine. Mixed anhydrides were also used for the colorimetric determination of epoxy-amine formulations (resulting from the reaction of bisphenol A diglycidyl ether and m-xylylenediamine) in a mixture of primary and secondary amines . In spectrofluorimetric methods, high sensitivity and selectivity are generally expected. However, problems of selectivity can occur in multi-component analysis because of the overlap of their spectra that could be observed. Specificity is a particular problem in the determination of fluorescent drugs. Synchronous fluorescence spectroscopy (SFS) has been found to have several advantages , such as simple spectra, high selectivity, low interference, etc. Because of its sharp, narrow spectrum, SFS serves as a very simple, effective method of obtaining data for quantitative determination in a single measurement . It has attracted the attention of many researchers and developed rapidly since it was firstly proposed by LIoyd . Synchronous fluorescence spectroscopy techniques are classified according to different scanning modes of monochromators into constant wavelength, variety angle, and constant energy. At present, the constant wavelength method, in which a constant difference between the emission and excitation wavelengths is maintained, is used most extensively. The combination of SFS and derivative is more advantageous than differentiation of the conventional direct spectrofluorimetry in terms of sensitivity, because the amplitude of the derivative signal is inversely proportional to the bandwidth of the original spectrum . Recently, derivative synchronous fluorometry (DSF) has been utilized for the determination of different mixtures in their co formulated dosage forms and biological fluids, such as metacycline and oxytetracycline , aspirin with caffeine  or aspirin with salicylic acid , diflunisal and salicylic acid , carvedilol and ampicillin , oxytetracycline in medicated premixes and feeds , cinnarizine with either domperidone or nicergoline [20, 21], sulpiride and mebeverine hydrochloride  and benzo[a]pyrene in spiked fatty foods . This technique was also applied for the determination of some drugs in the presence of their degradation products as in the case where sulpiride was determined in presence of its alkaline degradation product . Other techniques mentioned in the literature for the determination of drugs in mixtures include: HPLC with diode array detection exemplified by the determination of colistin and tiamulin in liquid and solid medicated premixes , sulfamethazine and trimethoprim in liquid feed premixes . HPLC employing pre-column derivatization was also applied as in the assay of colistin antibiotic in feeds after fluorimetric derivatization with phthaldialdehyde and 2-mercaptoethanol . Organic solvent extraction or solid phase extraction followed by HPLC were also used such as determination of tiamulin in swine feeds  and sulfamethazine in milk  respectively. Furthermore, various assay procedures were mentioned for the determination of some drugs depending on the fact that changes in their chemical environment will modify their native spectra and allow their determination in mixtures, as illustrated by the high binding ability of oxytetracycline with some divalent cations that causes changes in its native fluorescence spectrum facilitating its determination in veterinary formulations . The International Conference on Harmonization (ICH) guidelines  entitled "stability testing of new drug substances and products" requires that stress testing be carried out to elucidate the inherent stability characteristics of the active substance. Susceptibility to alkaline, acidic, oxidative, and UV degradation are of the required tests. The present work is capable of presenting an efficient novel DSF method for the determination of EBS in the presence of its different degradation products, and to study the results kinetically so as to indicate that the method is a stability indicating one. Up till now neither direct nor synchronous spectrofluorimetry has been reported for the analysis of ebastine alone or in presence of its degradation products. a) The fluorescence spectra and measurements were recorded using a Perkin Elmer LS 45 Luminescence Spectrometer equipped with a 150 W Xenon arc lamp. A 1 cm quartz cell was used. Derivative spectra were evaluated using Fluorescence Data Manager (FLDM) software, Perkin Elmer Buck i.e. FL WINLAB, version 400.02. 1) Ebastine (EBS); of purity 99.94% was kindly provided by Meivo Pharmaceutical Company, Cairo, Egypt. *Bastab® tablets (BN#112038), labeled to contain 20 mg ebastine/tablet, Meivo Pharmaceutical Company, Cairo, Egypt. *Evastine® syrup (BN# 94634), labeled to contain 5 mg ebastine/5 ml, Marcyrl Pharmaceutical Industries, El Obour City, Egypt. 4) Eosin (Riedel-DE-Haen AG seeize--Hannover) 1.5 × 10-3M aqueous solution. 5) Mcliavain buffers (pH ranging from 2-8) were prepared by mixing specific volumes of disodium hydrogen phosphate (0.2 M) and citric acid (0.2 M) . 6) Sodium hydroxide (0.1, 0.4 M solution), hydrochloric acid (0.1, 0.4 M solution), hydrogen peroxide (3% v/v solution); (BDH, Poole,UK). Stock solutions were prepared by dissolving 100.0 mg of EBS in methanol and further diluted with the same solvent as appropriate. The standard solutions were stable for 7 days when kept in refrigerator. Aliquots of standard solutions covering the concentration range of 0.1-1.0 μg/ml for EBS were transferred into a set of 10 ml screw capped test tubes, evaporated to dryness in a boiling water bath, and cooled under tap water. Then 5.5 ml of CAA reagent were added, and the test tubes were screwed up and heated in a boiling water bath for 35 minutes. The solutions were cooled and transferred quantitatively to 10 ml volumetric flasks; diluted to the mark with distilled water and mixed well. The fluorescence intensity of the resulting solutions was measured at 496 nm after excitation at 388 nm. A blank experiment was prepared simultaneously for each measurement. The corrected relative fluorescence intensity was plotted versus the final concentration of the drug (μg/ml) to get the calibration graph; alternatively, the corresponding regression equation was derived. To a set of 10 ml volumetric flasks, aliquots of ebastine standard solutions over the concentration range of 0.1-1.0 μg/ml were transferred, 1 ml of 1.5 × 10-3M eosin were added, followed by 2.5 ml of mcliavain buffer pH 2.2, the volume was completed to mark with distilled water and mixed well. The quenching of eosin fluorescence intensity was measured at 553 nm after excitation at 457 nm. After following the procedures mentioned in method IIA, The synchronous fluorescence spectra of the solutions were recorded by scanning both monochromators at (Δ λ) = 100, 60 or 40 nm in presence of alkaline, acidic, or UV degradation products respectively. A scan rate of 600 nm/min using 10 nm excitation and emission windows was used. The first and second-derivative fluorescence spectra of EBS were derived from the normal synchronous spectra using FLDM software. For best resolution and smoothing 99 points were used. The fluorescence intensities of the first and second-derivative spectra were estimated at 421 and 453 nm respectively when EBS was determined in presence of its alkaline degradation product. When the drug was estimated in presence of its acidic degradation product the first and second-derivative spectra were determined at 431 and 419 nm respectively. On the other hand ebastine was determined at 437 nm and 458 nm using first and second-derivative techniques respectively. A blank experiment was performed simultaneously. The peak amplitude of either the first or the second derivative technique was plotted versus final concentration of the drug (μg/ml) to obtain the calibration graphs. Alternatively, the corresponding regression equations were derived. Aliquot volumes of EBS standard stock solution (400 μg/ml) were transferred into a series of 25 ml volumetric flask to obtain a final concentration of 40 μg/ml; the volume was completed with 0.1 M sodium hydroxide or 0.1 M hydrochloric acid to prepare the alkaline or acidic degradation product respectively. The solutions were left in a boiling water bath for 50 minutes (alkaline degradation) and for 30 minutes (acidic degradation). Regarding the UV degradation, the methanolic solution of EBS was exposed to Deuterium lamp in a cabinet distance of 15 cm for 9 hours. These time intervals were determined so as to follow the ICH guidelines  accomplishing 30% degradation of the studied drug. Aliquot volumes of the degraded solutions were transferred to a series of 10 ml volumetric flasks, neutralized with 0.1 M hydrochloric acid or 0.1 M sodium hydroxide for alkaline and acidic degradation respectively, and the steps described under procedure for method IIB were followed. Twenty tablets were weighed and pulverized. An accurately weighed quantity of the powder equivalent to contain 20 mg of EBS was transferred into a small conical flask, extracted three successive times each with 30 ml of methanol. The extract was filtered into 100 ml volumetric flask. The conical flask was washed with few mls of methanol, transferred to the volumetric flask and completed to mark with the same solvent. Aliquots covering the concentration range were transferred either into 10 ml screw capped test tubes (method I) or to 10 ml volumetric flasks (method IIA and IIB). The steps described under "General Procedures for method I, method IIA or method IIB" were followed. The nominal content of the tablets was determined either from the calibration graphs or from the corresponding regression equations. 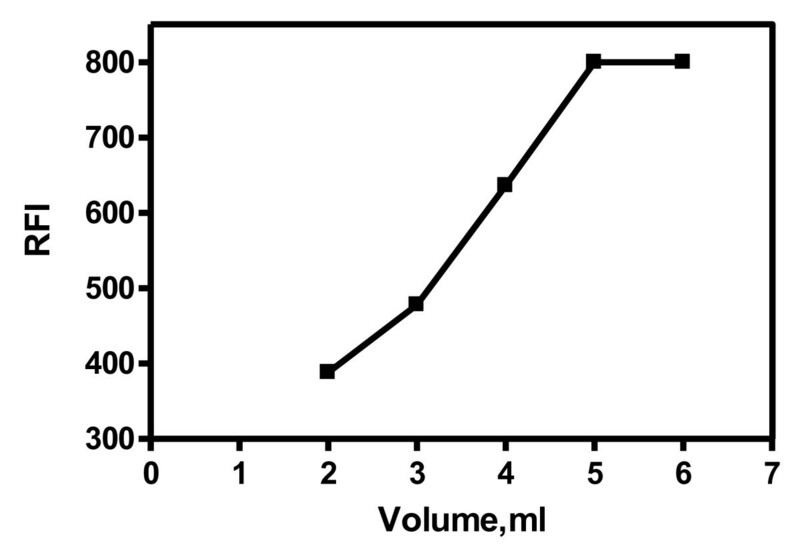 Aliquot volumes equivalent to 5 mg of the studied drug were transferred into a 25 ml volumetric flask, serial dilution was performed with methanol to obtain the working concentration range and the steps described under "General Procedure for method I, method IIA or method IIB" were followed. The nominal content of the syrup was determined either from the calibration graph or by using the corresponding regression equation. For the kinetic study, 2.5 ml of EBS standard solution (400 μg/ml) were transferred into a series of 25 ml volumetric flasks to obtain a final concentration of 40 μg/ml, 0.4 M sodium hydroxide or 0.4 M hydrochloric acid were added for method I. Regarding method II, 0.1 M hydrochloric acid or 0.1 M sodium hydroxide were used. The solutions were left in a thermostatically controlled water bath at different temperature settings (50, 60, 70, 80°C) for a fixed time interval (10 minutes). Aliquot volumes of the degraded solutions were transferred to a series of 10 ml screw capped test tubes (method I) and neutralized with 0.4 M hydrochloric acid or 0.4 M sodium hydroxide for alkaline and acidic degradation respectively, alternatively the degraded solutions were transferred to 10 ml volumetric flasks (method II) and neutralized with 0.1 M hydrochloric acid or 0.1 M sodium hydroxide for alkaline and acidic degradation respectively. The steps were completed as described under "General procedure". Log a/a-x versus time (minutes) was plotted to get the reaction rate constant and the half life time t1/2. Ebastine forms a highly fluorescent reaction product upon reaction with citric acid anhydride (Figure 2). Citric acid anhydride is proposed to condense with ebastine producing an internal salt. The high pKa value of EBS  indicates that the rate of condensation reaction is dependent on the basicity of the tetriary amine. 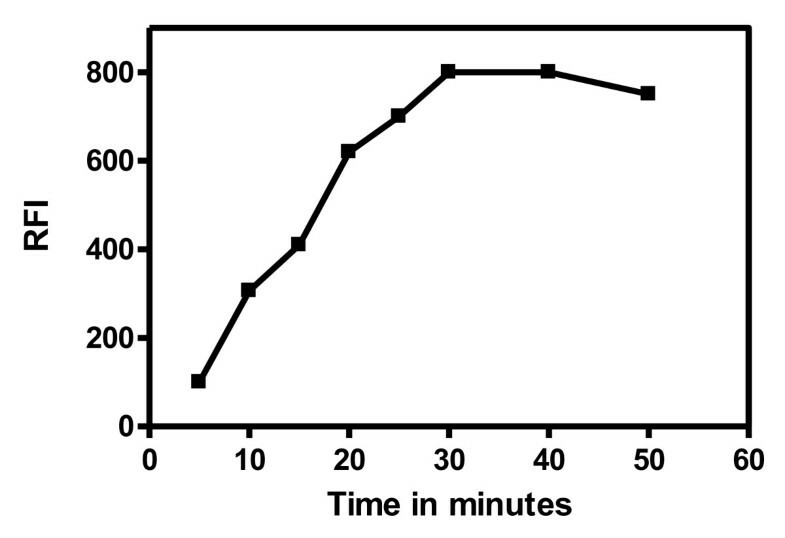 The fluorophore was formed instantaneously and remained stable for more than 90 minutes. Fluorescence spectra of the EBS (1 μg/ml) - mixed anhydride condensation reaction product: Where A and B are the excitation and emission spectra respectively. Ebastine and eosin Y react to form a complex that resulted in eosin Y fluorescence quenching. The maximum quenching wavelength was at 553 nm (Figure 3); this property was further extended to determine ebastine in presence of its degradation products. 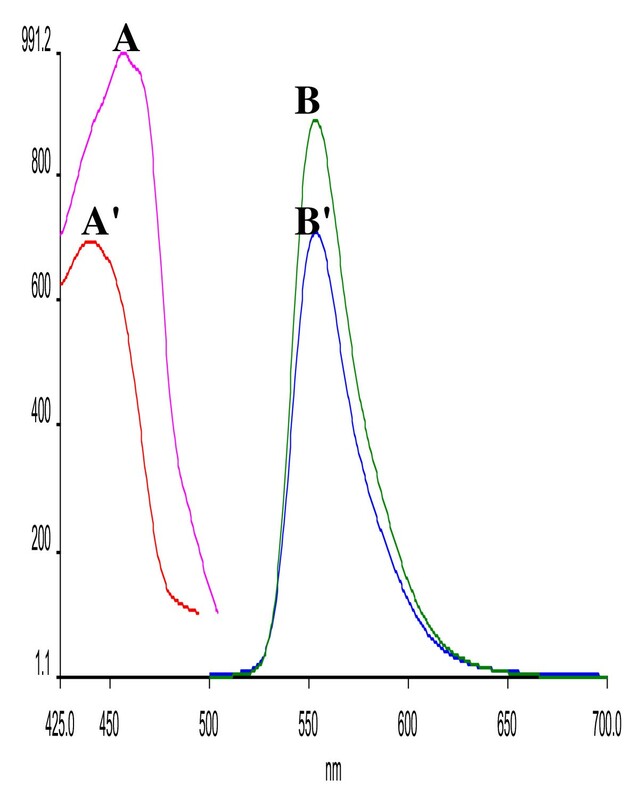 Figures 4a-c illustrate the fluorescence spectra of the alkaline, acidic and UV degradation products of ebastine respectively with corresponding λem/λex of (602/473 nm, 576/474 nm and 561/472 nm). Fluorescence spectra of the reaction product of EBS with eosin where: A and B are the excitation and emission spectra respectively of eosin. A' and B' are excitation and emission spectra respectively of eosin after addition of 0.15 μg/ml ebastine. Fluorescence spectra of the degradation products of EBS through its reaction with eosin. Where A and B are the excitation and emission spectra respectively of eosin. A' and B' are excitation and emission spectra respectively of: 4a) Alkaline degradation product. 4b) Acidic degradation product. 4c) UV degradation product. It is necessary to record first the normal synchronous fluorescence spectra of EBS in presence of its different degradation products to derive the first and second-derivative synchronous spectra. The synchronous fluorescence spectra of EBS were recorded at 457 nm in presence of its alkaline, acidic and UV degradation products (Figures 5a-c) respectively. There is a great overlap of the spectra of the drug and its degradation products in normal synchronous spectroscopy; this encouraged us to perform first and second derivative synchronous fluorescence spectroscopy technique (FDSFS&SDSFS) without prior extraction or separation step. Synchronous fluorescence spectra of EBS at 457 nm in presence of: a) Alkaline degradation product. b) Acidic degradation product. c) UV degradation product. The fluorescence spectra of EBS and its different degradation products were separated entirely using FDSFS and SDSFS with a zero crossing technique of measurement. 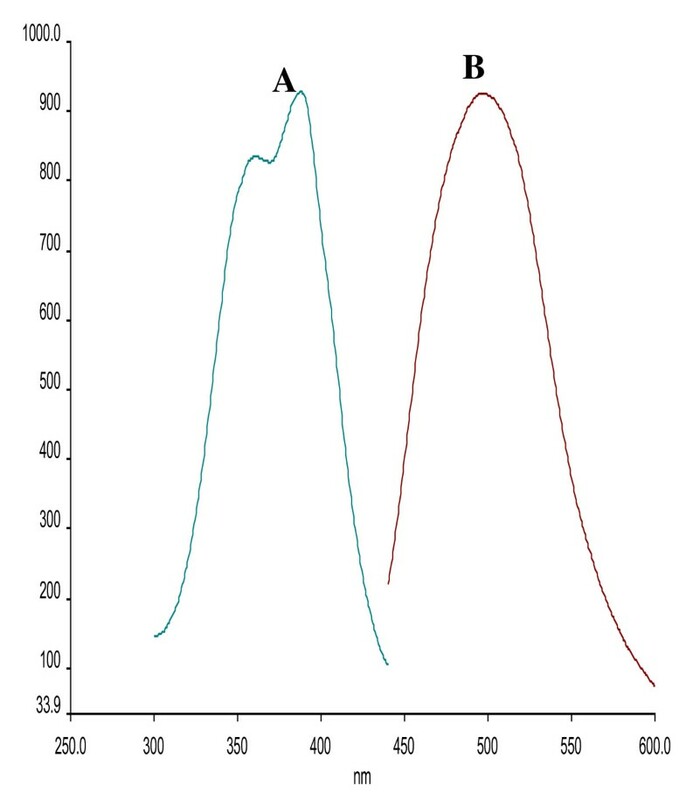 First and second derivative synchronous fluorescence spectra of EBS in presence of its alkaline degradation product (Figures 6a-b) show that ebastine could be separated at 421, 453 nm respectively. Similarly, entire separation of EBS in presence of its acidic degradation product was achieved at 431 and 419 nm using first and second derivative techniques respectively as shown in Figures 7a-b. While the FDSFS and SDSFS of the studied drug in the presence of its UV degradation product (Figures 8a-b) show that EBS could be determined at 437 and 458 nm respectively. First and second derivative synchronous fluorescence spectra of EBS in presence of its alkaline degradation product. a) FDSFS of EBS at 421 nm in presence of its alkaline degradation product. b) SDSFS of EBS at 453nm in presence of its alkaline degradation product. First and second derivative synchronous fluorescence spectra of EBS in presence of its acidic degradation product. a: FDSFS of EBS at 431 nm in presence of its acidic degradation product. b: SDSFS of EBS at 419 nm in presence of its acidic degradation product. First and second derivative synchronous fluorescence spectra of EBS in presence of its UV degradation product. a) FDSFS of EBS at 437 nm in presence of its UV degradation product. b) SDSFS of EBS at 458 nm in presence of its UV degradation product. The spectrofluorimetric properties of the formed fluorophore as well as the different experimental parameters affecting development and stability of the reaction product were carefully studied and optimized. Such factors were changed individually while the others were kept constant. Keeping all the variables constant, it was found that increasing the volume of supersaturated solution of CAA resulted in a gradual increase in the relative fluorescence intensity of the reaction product up to 5 ml, after which it remained constant, therefore, 5.5 ± 0.5 ml was chosen for the study (Figure 9). Effect of volume of CAA on the fluorescence intensity of the formed reaction product (EBS = 1 μg/ml). The effect of reaction temperature was also studied keeping all the variables constant. The fluorescence intensity increased remarkably by increasing the temperature from 60 to 100°C. Maximum fluorescence intensities were obtained through boiling of the reaction mixture. Hence, the reaction was carried out in a boiling water bath (Figure 10). 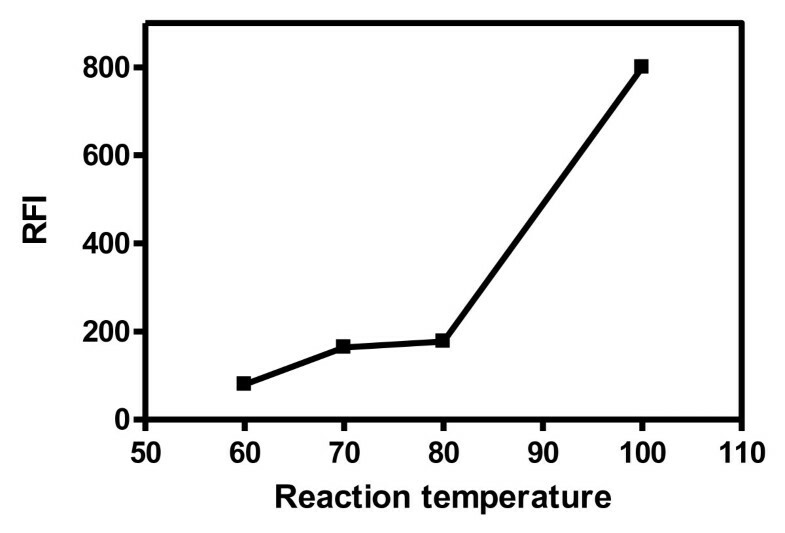 Effect of reaction temperature on the fluorescence intensity of the formed reaction product (EBS = 1 μg/ml). It was found that increasing the time of boiling of the reaction mixture resulted in a gradual increase in the relative fluorescence intensity up to 30 minutes and remained constant till 40 minutes, after which it decreased gradually, therefore 35 ± 5 minutes of boiling was used during this approach (Figure 11). Effect of boiling time on the fluorescence intensity of the formed reaction product (EBS = 1 μg/ml). Different diluting solvents were tested to choose the most suitable one for the formation of the reaction product, the investigated solvents included: water, methanol, acetonitrile, dimethylsulfoxide, dimethylformamide, and acetone. The highest fluorescence intensities were achieved upon using water. Moreover, its choice adds another advantage to the method. The results are demonstrated in Table 1. 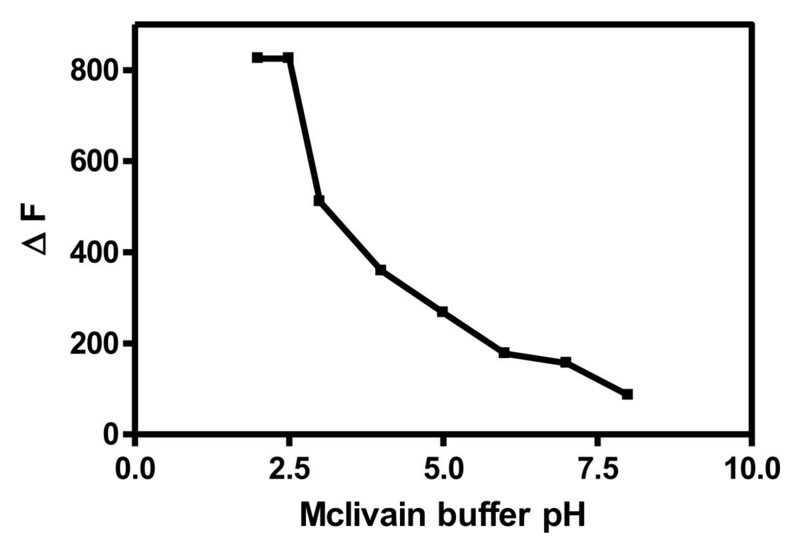 The effect of mcliavain buffer pH on the fluorescence quenching of eosin through its reaction with ebastine was studied over pH range of 2-8 keeping all the variables constant. It was found that maximum ΔF was obtained at pH value of 2-2.5, after which gradual decrease in ΔF was observed by increasing pH value (Figure 12), hence mcliavain buffer of pH 2.2 was used in this study. Effect of buffer pH on fluorescence quenching of eosin by EBS (EBS = 1 μg/ml). The effect of mcliavain buffer volume (pH 2.2) on the fluorescence quenching was also investigated. Gradual increase in ΔF values was obtained by increasing the volume of the buffer up to 2 ml, after which, the ΔF values remained constant (Figure 13). Therefore, 2.5 ml of mcliavain buffer pH 2.2 was used throughout this method. 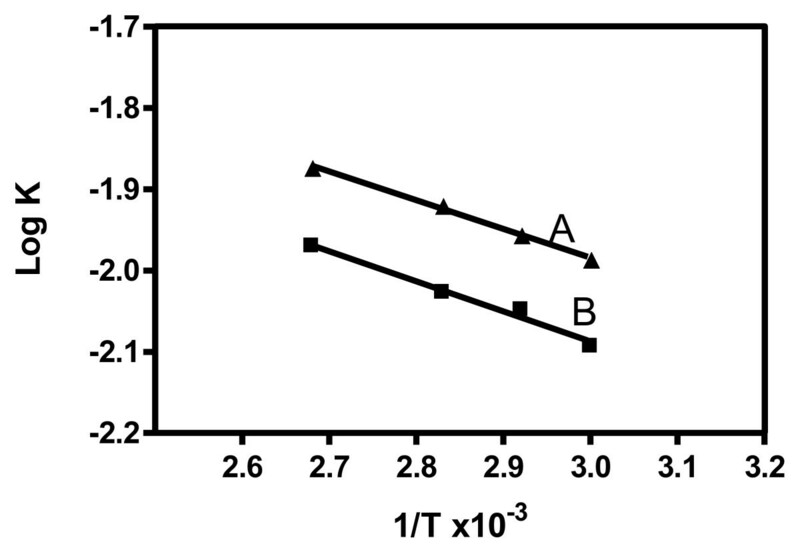 Effect of buffer volume on fluorescence quenching of eosin by EBS (EBS = 1 μg/ml). Different diluting solvents were tested to choose the most suitable one for maximum fluorescence quenching. The highest ΔF values were achieved upon using water. The results are demonstrated in Table 1. The synchronous fluorescence spectra of EBS in presence of its different degradation products were recorded using different Δ λ. The optimum Δ λ value is very important for performing the synchronous fluorescence scanning technique concerning resolution, sensitivity, and features. It can directly influence spectral shape, bandwidth, and signal value. For this reason, a wide range of Δ λ (40, 60, 80, 100, and 120 nm) was examined. Therefore, Δ λ of 100, 60 or 40 nm were chosen as optimal for separation of EBS in presence of its alkaline, acidic or UV degradation products respectively, since it resulted in distinct well separated peaks, with good shape, and highest SFI values. The relative fluorescence intensity, ΔF, or peak amplitude (by FDSFS and SDSFS) - concentration plots for ebastine by method I, method IIA, and method II B respectively were linear over the concentration ranges cited in Tables 2 and 3. The linearity of the calibration curves is validated by the high value of the correlation coefficient and value of the intercept which is close to zero. h = absolute value of the largest noise fluctuation from the baseline of the spectrum of a blank solution. While the limit of quantification (LOQ); is the lowest concentration of the analyte that can be determined with acceptable precision and accuracy. It is quoted as the concentration yielding a signal-to-noise ratio of 10: 1 and is confirmed by analyzing a number of samples near this value .The calculated values are listed in Tables 2 and 3. The proposed methods were tested for linearity, selectivity, accuracy and precision. Using the above spectrofluorimetric methods, linear regression equations were obtained. The regression plots showed that there was a linear dependence of the fluorescence intensity values, ΔF values, or peak amplitude values on the concentration of the drug over the ranges cited in Tables 2 and 3. The validity of the proposed methods was evaluated by statistical analysis of the regression data regarding the standard deviation of the residual (Sy/x), the standard deviation of the intercept (Sa), and standard deviation of the slope (Sb) . The results are shown in Tables 2 and 3. The small values of the figures point to the low scattering of the points around the calibration graphs and high precision of the proposed methods. The accuracy of the proposed methods was evaluated by analyzing standard solutions of ebastine. The results obtained by the proposed methods were favorably compared with those obtained by the comparison method . Statistical analysis  of the results obtained by the proposed and comparison methods using student's t-test and variance ratio F- test, showed no significant difference between the performance of the two methods regarding the accuracy and precision, respectively (Tables 4, 5). The proposed methods were evaluated by studying the accuracy as percent relative error and precision as percent relative standard deviation (RSD%); the results are summarized in Tables 4, 5. The repeatability was evaluated through analysis of different concentrations of the studied drug in pure or in dosage forms on 4 successive times. The mean percentage recoveries listed in Table 6 indicate the high precision of the proposed methods. It was performed through repeated analysis of variable concentrations of EBS either per se or in dosage forms on four successive days. The results are abridged in Table 6. The robustness of the methods adopted was demonstrated by the consistency of the relative fluorescence intensity, ΔF, or peak amplitude values with the deliberately minor changes in the experimental parameters such as: volume of CAA (5.5 ± 0.5 ml), boiling time (30 ± 5 min. 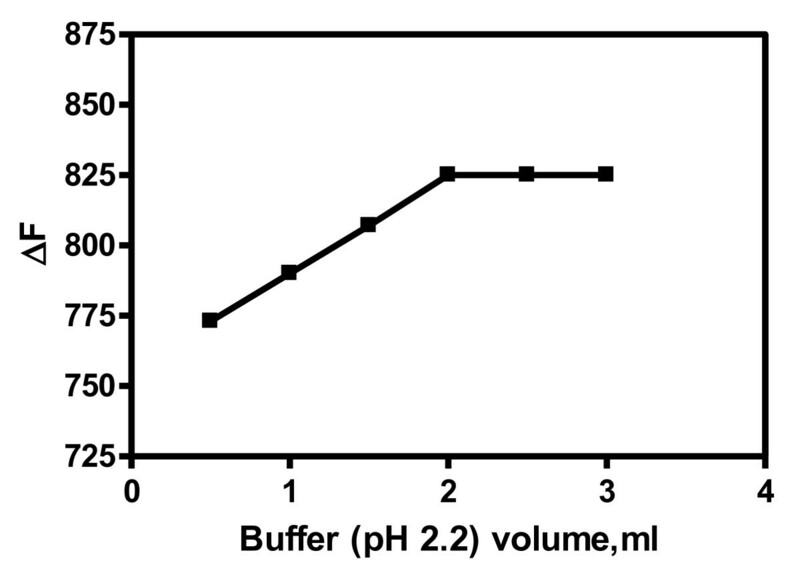 ), buffer pH (2.2 ± 0.2) and buffer volume (2.5 ± 0.5) which did not greatly affect the results obtained. The proposed methods were successfully applied to the determination of ebastine in its dosage forms. The results are summarized in Tables 7 and 8. No interference from the sample matrix was observed, the results were found to be in good agreement with the labeled amount. The proposed methods are based mainly on the reaction between citric acid anhydride and eosin with the tertiary amino group of ebastine. Therefore, degradation was attained upon induced alkaline degradation using sodium hydroxide (0.4 M for method I, 0.1 M for method II), acidic degradation using hydrochloric acid (0.4 M, 0.1 M for methods I and II respectively) and oxidative degradation using 3% hydrogen peroxide. Upon alkaline and acidic degradation of the drug, the relative fluorescence readings or ΔF values decreased gradually with time, thus indicating that the proposed methods are stability indicating ones. However, the proposed methods did not indicate the peroxide degradation of ebastine, and this may be due to the formation of the N-oxide derivative of the drug which is not susceptible to react with either CAA or eosin owing to the blocking of the tertiary amino group. Both alkaline and acidic degradation were found to be temperature dependant as presented by the acidic degradation for method I (Figure 14). The first order degradation rate constant and the half life time at each temperature were calculated (Table 9). Plotting log Kobs values versus 1/T, the Arhenius plots were obtained and exemplified by Figure 15. The activation energy for each type of degradation was also calculated. Semilogarithmic plot of EBS (500 ng/ml) versus different heating times with 0.4 M HCl. (A = 80°C, B = 70°C, C = 60°C, and D = 50°C). Arrhenius plot for the degradation of EBS using method I. Where: A: (acidic degradation), B: (alkaline degradation). Upon exposure of methanolic solution of the concerned drug to Deuterium lamp with a wavelength of 254 nm at a distance of 15 cm in a cabinet for different time intervals, and then the studied methods were applied, it was found that EBS decomposed by 22,19% applying method I and method II respectively. The stoichiometry of the reaction between ebastine and citric acid anhydride was studied using limiting logarithmic method . As shown in Figure 16, a plot of log RFI versus log [CAA] and log [ebastine] gave straight lines. The values of the slopes were 0.85 and 1.015 respectively; pointing out that the drug reacts with the fluorigenic reagent in a ratio of 1:1. By analogy to a previous study , the reaction pathway is proposed to proceed as shown in scheme 1. Limiting logarithmic plots for the molar ratio of EBS and CAA. Proposal of the reaction pathway between EBS and CAA. Two validated stability indicating spectrofluorimetric methods were developed for the determination of ebastine (EBS) in pharmaceutical preparations depending on reaction with its tertiary amino group. The simplicity, low cost, and sensitivity of the proposed methods allow their use in quality control laboratories for routine work. This work was financially supported by Faculty of pharmacy, Mansoura University. FI designed the proposed method and analyzed the data statistically. MKSE proposed, planned and supervised the whole work. MIE coordinated the study and modified the text. MEKW carried out the experimental work. All authors read and approved the final manuscript.